Jeffrey Minucci measures nitrogen fixation in black locust seedling roots. The process is known as an acetylene reduction assay, and begins with slicing nodules off seedlings’ roots. Photo by Nina Wurzburger, UGA. Atmospheric nitrogen gas, or N2, is plentiful. This form of nitrogen is inaccessible to most plants. However, legumes such as beans, clovers, and black locust trees have struck up an evolutionary partnership with microbes. The microbes live in nodules on the plants’ roots, where they fix nitrogen. Nitrogen fixation involves converting nitrogen gas into ammonium, a form that plants can use. For the microbes, these compounds are byproducts of their own physiological processes. For terrestrial ecosystems, symbiotic nitrogen fixation is irreplaceable. The scientists grew 140 black locust seedlings for the study. Photo by Jeffrey Minucci, UGA. 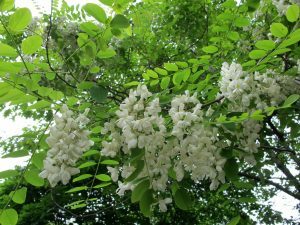 Minucci, Miniat, and their colleagues collaborated to study black locust (Robinia pseudoacacia) and its response to drought. 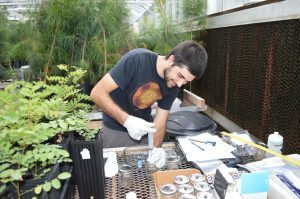 Minucci led the study, which was published in the journal New Phytologist. 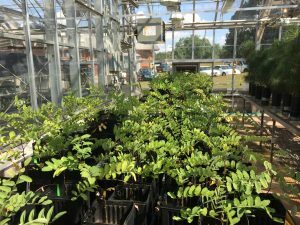 The scientists grew 140 black locust seedlings in a lab. All the seedlings were grown with the same average amount of soil moisture. However, the scientists watered the seedlings – or withheld water – in ways that mimicked drought. At the end of the study, the scientists measured seedling size and weight. Drought frequency did not affect the total biomass or the average nitrogen-fixing rate. However, drought frequency did affect the way seedlings responded to individual droughts. “Seedlings tolerated long, but infrequent droughts,” says Miniat. “These seedlings acclimated to drought, and actually began fixing nitrogen faster.” During long lasting, infrequent droughts, seedlings also began using water more efficiently. They invested more resources into root growth, and stored more nitrogen in their leaves. Black locust is in the legume family and – with the help of microbes – can fix nitrogen. Photo by Kristine Paulus, courtesy of Flickr. Seedlings that experienced frequent, short duration droughts fixed nitrogen more slowly. “These seedlings did not acclimate to drought and instead reduced their rates of photosynthesis and nitrogen fixation” says Minucci. “However, as soon as the droughts were over, these seedlings had major growth spurts.” After droughts, the seedlings also began fixing nitrogen more quickly. 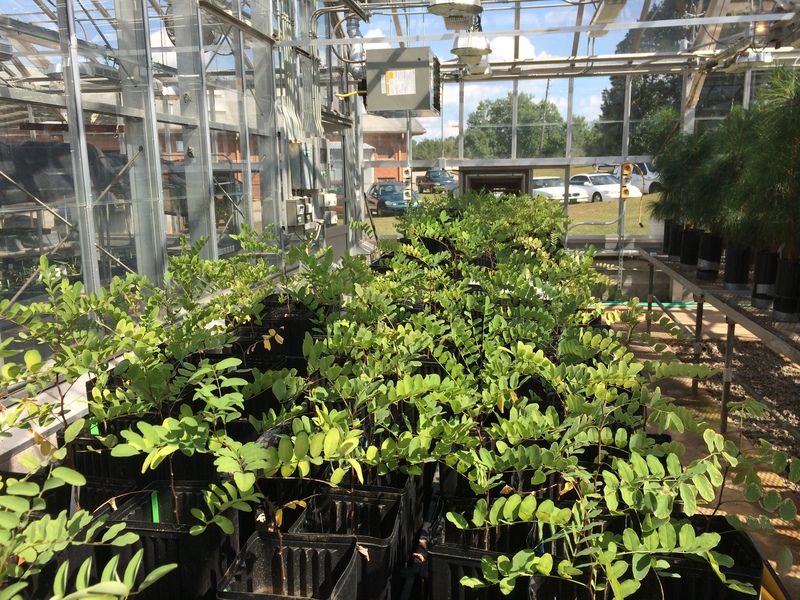 The study shows that black locust seedlings are resistant to both prolonged drought and frequent drought. Nitrogen fixation may be the key to drought-resistance. Because they can fix nitrogen, black locust seedlings can grow quickly after drought. Storing extra nitrogen in their leaves also helps them acclimate to infrequent, but lengthy droughts. Competition between trees could affect drought response at the forest level. However, the study has broad implications. For more information, email Jeffrey Minucci at jminucci@uga.edu or Chelcy Miniat at cminiat@fs.fed.us.